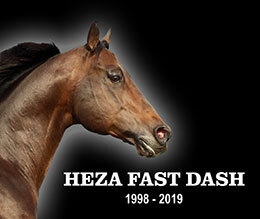 The #8 All-Time Leading Sire of Money Earners' Heza Fast Dash died on Thursday at the age of 20. BREAUX BRIDGE, LA—JANUARY 25, 2019—Heza Fast Dash, the #8 AQHA Racing All-Time Leading Sire of Money Earners, was euthanized late Thursday following complications from laminitis. The 20-year-old son of champion sire Heza Fast Man will be buried at Robicheaux Ranch in Breaux Bridge, Louisiana, where he stood his entire stallion career. "For a horse that only made $136,000 on the track to produce over $30 million so far in progeny. . ." farm manager Ryan Robicheaux said late Thursday. "He has done so much for our family and we will never forget him. He has been here 17 years at Robicheaux Ranch and he only left this ranch twice for a day or two, but to know I’m not going to see him anymore will be hard on all of us." Bred in Oklahoma by leading breeder Weetona Stanley, Heza Fast Dash was foaled in 1998 at Lady Bug Stallion Station from the multiple grade 1 producing Dash For Cash mare First Prize Dash, a sister to all-time leading sire First Down Dash. 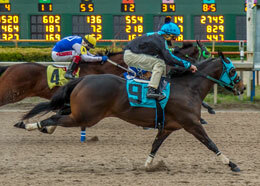 Racing in the silks of Mrs. Stanley, the bay stallion won or placed in 11 of 18 career starts to 4 and earned $136,123 He won the grade 3 Blue Ribbon Futurity and was second to Oak Tree Special in the grade 1 Remington Park Futurity. He was also a finalist in the Oklahoma Horsemen's Association Derby. Leading sire Heza Fast Dash and Robicheaux Ranch farm manager Ryan Robicheaux. Upon his retirement in the summer of his 4-year-old season, Heza Fast Dash was purchased by a partnership headed by Coulon Jumonville and moved to Robicheaux Ranch to begin his career as a stallion. He was owned by a syndicate and still managed by Jumonville at the time of his death. His first crop hit the track in 2006 when he ended the season as the #2 leading first-crop sire of money earners with 20 winners and 2 stakes winners earning $686,527. A top three leading sire in his second and third crops he climbed into the top-ten leading sires of money earners list by 2010, where he remained throughout his career. Heza Fast Dash set a personal season progeny earnings record of more than $3.7 million in 2013 when he was the #1 Leading Sire of QH Money Earners in the US. In 2017 he was represented by his first AQHA Racing champion when B And G Fast Dash was named the 2017 champion Distance Horse. He ended 2018 in the #5 leading sire of money earners spot with $3.3 million behind the likes of Apollitical Jess, First Moonflash, One Famous Eagle and Pyc Paint Your Wagon. 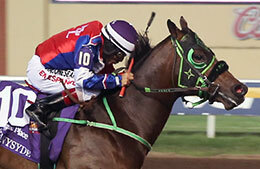 His leading money earner last season was Bobby D. Cox's Heritage Place Futurity(G1) winner Sunnyside ($434,961). From 14 crops to reach racing age, through January 24, Heza Fast Dash has sired 953 foals to reach racing age, 552 winners, 108 black type (15%), earners of $30,648,906 with average earnings per starter of nearly $40,000. "Heza Fast Dash was no stranger to remarkable achievements whether it's on the racetrack or in the sale ring," said Coulon Jumonville, commented in a story about the stallion last year. 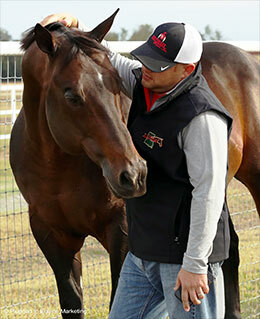 "Heza Fast Dash yearlings averaged $22,530 making him the #1 sale sire in Louisiana." 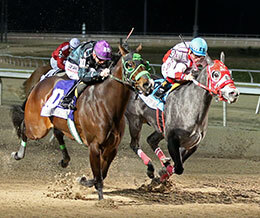 Eysa Jess Jumpn became Heza Fast Dash's first 2019 stakes winner when she won the Billy Montgomery at Louisiana Downs on January 19. From one of the most prolific female lines in the industry, Heza Fast Dash is brother to Heritage Place Futurity(G1) winner Fast First Prize SI 102 ($244,929), a half-brother to Grade 1 winners First Prize Leesa SI 106 ($488,270), First Carolina SI 106 ($415,047), First Prize Robin SI 103 ($295,147), grade 1-placed First Prize Perry SI 102 ($243,946) and four other black-type winners. This is the immediate family of such runners as Ruidoso Futurity(G1) winner Apolltical Chad SI 95 ($879,090 to 4, 2018), Rainbow Futurity(G1) winner Ms First Prize Rose SI 101 ($550,105), Remington Park Futurity [R] winner and leading first-crop sire Coronado Cartel SI 98 ($416,178), West Texas Futurity(G1) winner Fast Prize Zoom SI 112 ($192,875), AQHA Distance Challenge Championship(G1) winner Cr Tuckernuck SI 98 ($215,649), Heritage Place Derby (G3) winner Pyc Fun N Fancy SI 015 ($474,660 to 3, 2018), Remington Park Oklahoma-Bred Futurity(RG3) winner Im A Fancy Pyc SI 92 ($454,765), Louisiana Bred Laddie Futurity(RG2) winner First Prize Denim SI 103 ($323,456), Dash For Cash Derby(G2) winner Dashin For A Prize SI 110 ($275,770), to name only a few.